The prison of the demon will yield! The champions who had once locked up the demon lord are missing. Now, the undead are gathering around the monster's jail, attracted by its growing power. You must find the dead or dead heroes, and find out how to end the summoning. Will you be able to revive this legendary treatise that had subjugated this monster? Or will the treaty of champions disappear with its creators? 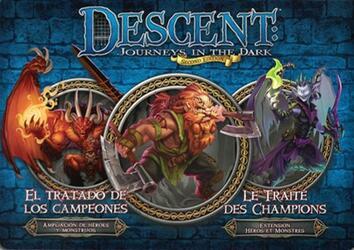 Add new legendary heroes, as well as monster abjects, to your Descent parts: Dark Travels, Second Edition with Heroes Expansion and Monsters Treaty of Champions. Discover the unique characteristics of these monsters and heroes by living the quests included in this expansion, individually or through Rumor Cards.